To the momma, feeling overwhelmed. I see YOU!! And you are killin’ it! You’re doing an incredible job, momma! You are seen, you are appreciated, you are loved, despite the feelings you feel. You aren’t just seen by me, a fellow mom in the trenches, but you are seen so deeply and so completely by our Heavenly Father. He sees you. He sees YOU! In every season, in every struggle, in every triumph, He sees you and KNOWS you, and cares for you. He hasn’t forgotten you. He hasn’t left you. He is with you. Prayer: Lord, thank you for these mommas who serve their families endlessly. I pray that you would refresh and renew their strength. Help them to know they are seen and loved by You, and that they are not alone. I pray you would send them encouragement and incredible friendships. I pray you would bless them. Meet them right now, show them you are there with them! Amen. Action: Give a fellow mom some extra love and encouragement this week. Let’s take on life together! I know that I talk about this a lot, but it can be so easy to lose yourself in motherhood. Now, I don’t mean that being a mom isn’t the most amazing privilege in the whole world; I definitely believe this with my whole heart; but sometimes it becomes your only identity. While my husband is the most incredible human being in the world, I find it so hard to be able to convey to him this feeling that I have struggled with since earning the title of “mommy”. I know that he would do absolutely anything in the world to make me feel valued and like a total mom rock star, but its so hard to describe how much this little person that you birthed, or adopted, that you became a mommy to, has completely taken over your life; in the most amazing and the most challenging way. Maybe you are super woman, and you never lost your identity in motherhood, which in that case, I need all your wisdom, knowledge, and secrets! Or maybe you haven’t realized it yet. It took me awhile to find out why I just didn’t feel “like myself”. This struggle is all too real to me. Some days I feel like I was made for this being a mom thing, which SPOILER: I was! But some days, I question what I am doing with my life. There is no way to prepare you for the transition into motherhood. Nothing to get you ready to care for someone else- endlessly. It consumes your life. Just to be clear, this is not a complaint, I absolutely would NOT trade my amazing kids for ANYTHING in this world BUT that does not neglect the fact that it is HARD!!! This transition still hits me in the face, even after 2 1/2 years. The hardest part is accepting that, in this season, I can’t be as involved with the church as I would like to be. Man, this is so, so hard for me to accept. I have fought this reality kicking and screaming. In High School, I felt called into the ministry and since then I have chased this dream wholeheartedly. Have you had passions or dreams that you have put on the back burner since becoming a mom? Now, I should say that I am still involved in ministry, its just not in the capacity that I am used to or that is ideal for me and my ways. I know all you seasoned moms out there will remind me that I will miss these times with my kids and look back and cherish these moments. I know that is all too true… which makes me feel guilty for having these moments where I wish I was somewhere else, doing something else. I am being so real with you, friends. There are moments where I am filled with envy and jealousy. I see my amazing hubby living out and walking in the same passions and dreams that I have, and it is so hard to not feel like I am missing out. I look at him longingly, wishing I could be there by his side doing ministry full-time with him. I love my kids so much it hurts. I love my husband so much it hurts. And I love ministry so much it hurts. Sometimes, we forget that what we are facing right now is not going to last forever. In this season, I’ve been praying for the Lord to give me contentment. I want to be content in this season without forgetting and completely neglecting my dreams. This is something I must do to thrive. I must continue to dream. I want to be able to teach my kids to dream and chase after those dreams. I can’t do that if I don’t dream myself. So, keep dreaming. God has BIG dreams in store for you, and for me. 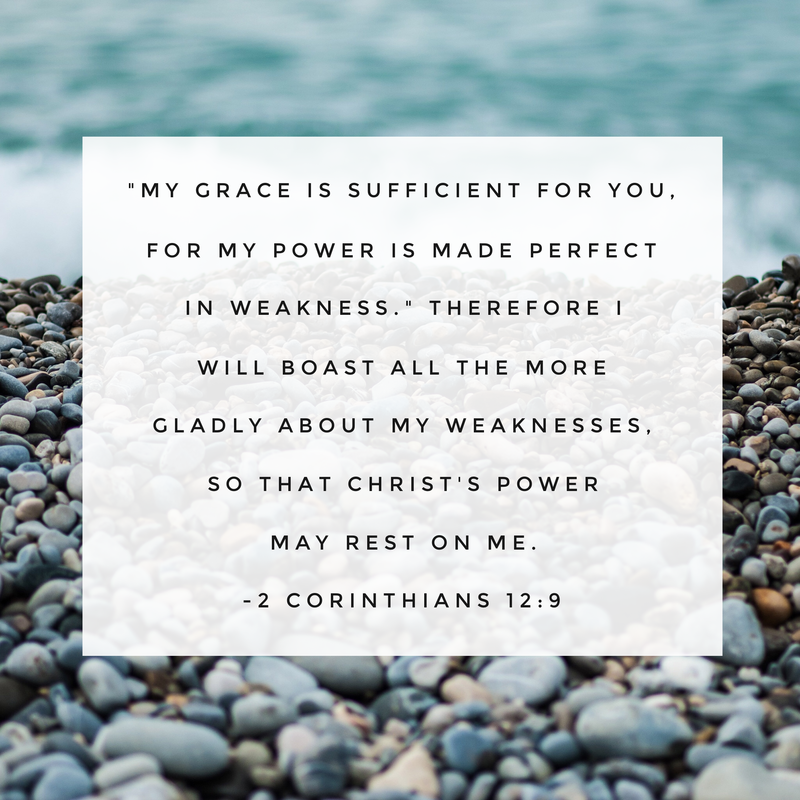 In these moments when I am SO VERY aware of my weaknesses, I am beyond humbled and thankful that I have a God who is strong enough to carry me. PRAYER: Jesus, I thank you for everyone reading this blog. I pray that you use my struggles and my weaknesses to encourage even just one person out there. I pray you be with all my mom friends out there. I pray that you would send them some encouragement. Being a mom is so hard on its own without adding other struggles or trials they may be facing. I pray that you fill them with peace, hope, and new dreams. Speak your dreams into their lives. Thank you for what you have done and are yet to do. Amen. Action: Take some time for yourself this week. Do something you LOVE! Write down some dreams that you want to see become reality. Take time to be refreshed and remind yourself that you are not just an AMAZING mom, but YOU are an AMAZING, and unique individual with gifts and talents! I am praying for you dear friends. I am just taking this journey one step at a time and trying to be real and transparent in my weaknesses and allowing HIM to be my strength. I have missed you guys!! This past month or so has been slammed full of summer fun for us, and I hope it has been for you too! We had friends and family visit, a week of youth camp, and finally our family vacation. It’s been a blast, but has kept me busy and away from you! When I was a freshman in high school, God totally wrecked my life. I was a lost girl who was searching for love and purpose in things that would never fulfill me, and I was royally screwing up my life in the process. Jesus found me in the middle of my hurt and brokenness and changed me. He gave me hope. He gave me a purpose greater than fulfilling my selfish desires. From that moment on, I lived my life completely for Him. I jumped all in and started serving in our youth ministry. I couldn’t get enough! I was involved in anything and everything. I went to camps, was called into ministry, went on missions trips, served anywhere and everywhere there was a need. I loved every minute of it! I poured myself out for our youth ministry, and it became my passion. Fast forward a few years when I fell in love with my best friend. (I’ll share this story another time) I enjoyed every moment I was able to spend with him, and I still do! He was a pastor’s kid who spent time running from his calling, but was now on the path to becoming a pastor himself. It was a dream come true! I would be able to be involved in ministry alongside my awesome, Jesus loving hubby! After being married for 4 years, we became pregnant with our first child, Jaxon. We were also transitioning to our first youth pastor position. I could not be more excited about beginning this new journey as youth pastors and as parents. These were two of my biggest dreams coming true!! I was stoked! Have you ever expected something to turn out one way, only to find yourself in a completely different reality? 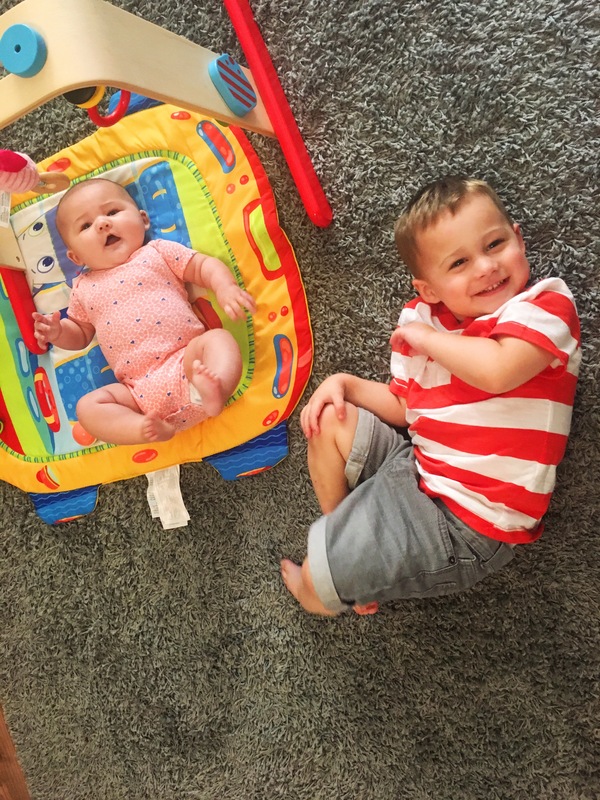 I had this vision of being a beaming, wonderful, carefree mom- after all, I had four younger siblings I helped raise – this being my pre”children of my own” thinking. I thought I would nail this momming thing. I was obviously very naive and had no idea how hard it was going to be. Needless to say, I had a really hard time transitioning into motherhood. Did I love Jaxon with all my heart? Of course! Did I love being his mom? Absolutely! But, man! Motherhood is stinking hard! Sometimes, I think the most difficult part is letting go of the way you thought things were going to be. It’s hard letting go of your expectations and dreams of how you thought things were going to go and come to terms with your reality. This is something I continue to learn and battle daily. I imagined every day being beautiful and magical with this precious and perfect baby boy and that it would all come so easy and naturally to me, but it didn’t. My days had beautiful and magical moments but they also had hard and lonely moments. I was lost and feeling like I had failed as a mom because I didn’t enjoy every single second of it. Some days I missed my old life. I missed my freedom. 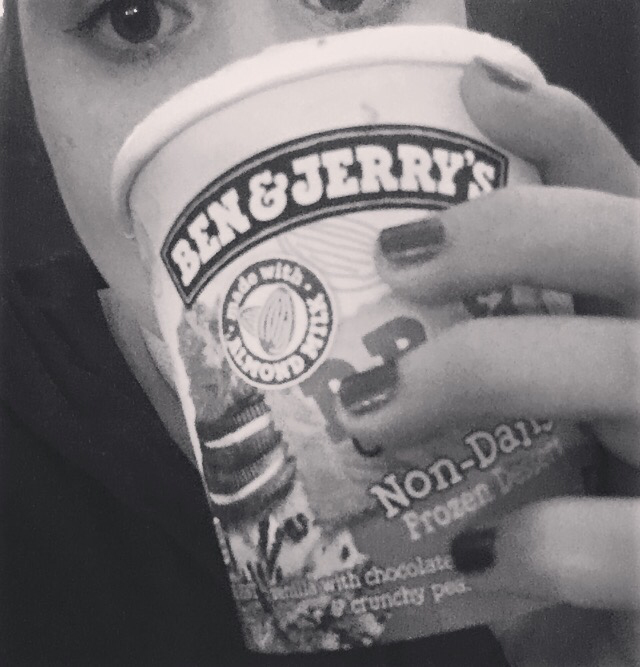 I missed “me” time. I missed having alone time with my hubby. I never realized how selfish I was until I became a mom. ** I have to pause here to say, if you have mom friends in your life who come alongside you and cheer you on in your good and bad moments, you are incredibly blessed. If you don’t have mom friends like this, I totally feel you! I went through the first two years of motherhood alone and clueless. I had access to a couple really great moms, but I didn’t utilize those friendships like I should have. I thought that because I had a hard time transitioning to being a mother and because I missed how things used to be, that it made me a bad mom. I really beat myself up and struggled with a lot of guilt. I still struggle with guilt some days. But- now I know the importance of saving some time for me just to be me and be by myself. I have to remind myself constantly who I am and that being a mom doesn’t cancel that out. Mom out there, who feels like she is constantly coming up short, who feels alone and missing out, who feels stuck in her day to day like you’re never going to have fun again, take a moment and breathe. Acknowledge all those feelings you are having. Soak them in. Then, give them to God. Let Him carry all the worry, anxiety, fear of what could happen or might happen, fear of you not doing a good enough job, and rest in knowing you are CHOSEN. You are chosen for this season and you are going to be okay. There are many days when I still have a hard time transitioning to motherhood. I think back on the girl I used to be. The one with crazy hair, a zeal for life, always dreaming, and I wonder where she is. It is so easy to get so caught up in taking care of everyone else that we forget that WE are CALLED, we are CHOSEN, we have GREAT things in store, we have dreams that have yet to be dreamt, and that the best is ahead of us. So today, spend some time with the Lord. Ask Him to place those dreams and desires back in your heart, that spark back in your eyes, and dwell in who He has called you to be! My son Jaxon is a 2 year old whirlwind. He is no fear, never slowing down, sneaky mess making 100% boy, all the time! We have been working with him on how to brush his own teeth. He absolutely loves brushing his teeth! He actually does a pretty good job getting all his little chompers too! So… the other day Jaxon and I were brushing our teeth together and he looked like such a big kid doing it all by himself. I couldn’t believe that my baby boy was standing beside me brushing his own teeth. He quickly lost interest and ran off. I finished brushing my teeth and went into the living room. Hope you have a great and mess free day! But if you don’t… take a picture and find some humor in it. Ever feel like you are nailing this parenting thing? You know those days where you made it without completely losing your mind. Your child listened and followed directions, you did art time, song time, taught them a thing or two, made lunch, all while managing to not flip out on anyone or have any sort of emotional breakdown. A day where you are sad to lay them down for bed because you had such a great time with them that you just want to soak up every second that you can? I had a day like this once… I think. But – more times than not, I lose it at least once. I know this doesn’t set me up to be “parent of the year” and certainly not SAHM of the year. Most days I mess up most things. Most days I feel like I have NO IDEA what in the world I’m doing. Most days I wonder how much counseling my kids are going to need if they ever survive this. Most days I question my sanity and wonder how they let me leave the hospital with these kids. 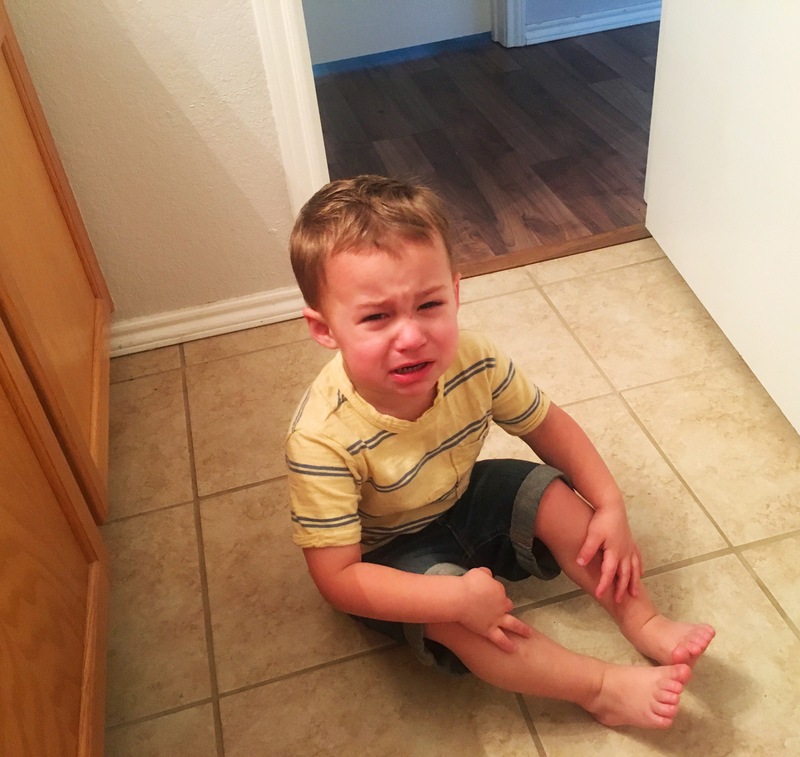 Jaxon throwing a fit because I had the audacity to go to the bathroom. On days when I feel like I can’t get one thing right or anything right at all and I feel like everything I do is the complete WRONG thing, when I feel like my child will never learn to be the kind, considerate, person I keep trying to shape him to be, when I feel like I will never get the hang of this momming thing, there are tiny sparkling moments throughout the day to remind me that its going to be okay. Its amazing how HUGE a difference such a tiny moment can make in this mommy’s day. All I need is one hug, one kiss, one kind action, one moment of listening and following directions, a new thing learned, a tiny milestone, a helpful moment, a silent moment (especially this one😉). Just ONE of any of these things can melt my hardened heart. They can melt my anger, selfishness, frustration, weariness, insecurities, and doubts. When all that melts away, all that remains is love. LOVE for this tiny human who has such a hold on me. Who has this power over me to bring out my best despite my worst. In those moments I am reminded not only how much I love my wonderful and amazing children but also how the Lord feels that same (BUT MUCH GREATER) love for me and for you! It doesn’t matter how far we fall, how many mistakes we make, how many times we should’ve driven Him crazy, His grace for us exceeds what we could ever imagine. He loves us. He sits patiently waiting for us to realize our need for Him and He longs to help us. In tough moments be encouraged and know that you are not alone. You were specifically chosen to be the mommy to your kiddos. There is no one else more qualified or who could do this job like you! God called you to your kids and He will help you when you ask! Prayer: Lord, I pray for every mom out there that is feeling discouraged and overwhelmed. Every mom who feels so lonely and inadequate. I pray you would encourage her and send deep friendships into her life to lift her up and love her. I pray you would give her peace and comfort knowing you are by her side. Fill her mind with Your truth and dissolve the lies the enemy tries to get her to believe. Give her the strength she needs. Lead her in Your love and grace. Help her to become the mom You have called her to be and to be able to walk in that confidently. Amen. Action: Reach out to another mommy this week. Let her know she’s not alone. Encourage her. Pray for her. Show up at her door (with a heads up) with a venti iced white mocha with coconut milk and toffee nut. Show her that you are there. This will bless her which in return will bless you far greater then you would expect! It’s hard to fully convey how much becoming a mother has changed me. There is nothing like staring in the face of the responsibility of raising this tiny human into a thriving adult. Never have I felt such deep and overwhelming fear, inadequacy, anxiety, uncertainty, guilt, worry, and loneliness. It’s easy to let these feelings take over sometimes. BUT nothing, no amount of difficulty or negative feeling can steal the absolute JOY that motherhood brings. I never imagined I was capable of such overwhelming love. A love so strong that it hurts. A love so automatic that it takes over everything else. Looking at my kids, I’m in awe that I could be trusted with something so important, so difficult, so beautiful, so rewarding. For every difficult moment, every self-doubt, every emotional breakdown, every time I feel like I’m doing it all wrong, there are a million more tiny moments that fill my world and fill my heart with a flood of absolute and complete bliss and perfect happiness. It amazes me how one tiny moment can change my whole outlook in a split second. A sweet smile, a slobbery kiss, a monumental milestone, a kind action, a right choice, a hug so tight you can barely breathe, a cuddle with you on the couch, playing pretend, singing the ABC’s for the thousandth time, sharing a toy with a friend; these tiny moments of accomplishment make up the joy of being a mom. I can feel like a failure and that feeling can disappear at a moments notice when my kid looks as me with such pure and innocent love and trust. These motherhood moments slip through our fingers like grains of sand. Take those moments, use them as an opportunity to build castles with that sand and build as many as you can.